Get ready to enjoy some of the loveliest floral needlepoint projects ever created! 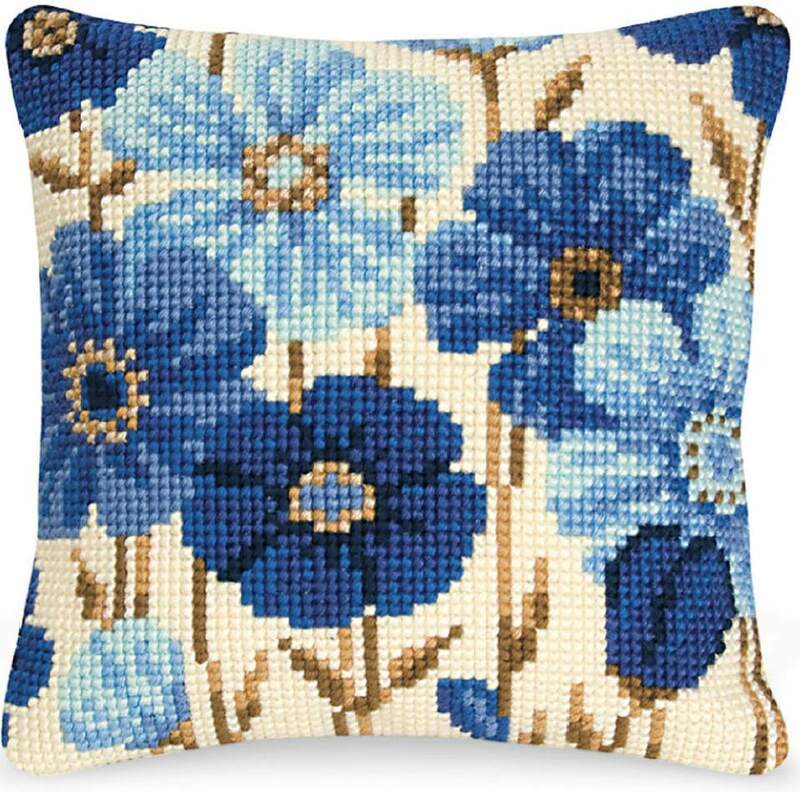 Decorate a sunroom with blue flower pillows; make a beautiful spring floral needlepoint fashion accessory, or indulge in modern art stitching with abstract Bargello patterns. After stitching, you can finish the beautiful needlepoint pieces into clutch purses, insert them into tops of decorative boxes, or turn them into any home decor item you choose. Stitch this floral needlepoint pattern in only a few hours with basic long stitches. The free design by Jean Smith is best suited for one-ply tapestry yarn or three-ply Persian yarn. Just raid your thread stash and choose colorful fibers to stitch a unique spring needlepoint project. Download this free pattern by Terrie Lyn Nutter, purchase a piece of 40-count silk gauze and use any leftover stranded silk you have on hand to make this elegant spring needlepoint design. You'll need magnification and good lighting to do this project. Work the lovely miniature in basic tent needlepoint stitches and insert it into a purchased brooch jewelry finding. Make a 16-inch square pillow top in no time at all with this gorgeous Quickpoint needlepoint pattern. The kit costs $35.99 USD and includes everything you need to stitch the pillow top, but you can also purchase the form and backing if you desire. Visit your local needlepoint shop to buy this charming design from Maggie Co, and then download the free guide to stitch the project with memory thread and a variety of decorative needlework techniques. Learn how to use surface embroidery to accent your needlepoint with the step-by-step instructions in the detailed guide. Sew a mini cosmetic bag or change purse with this attractive Bargello needlepoint pattern from The Caron Collection. The floral design looks like spring tulips when stitched in yellow, green, red and blue colors. You will need #18-mesh mono needlepoint canvas and several #20 tapestry needles to complete the project. If you are comfortable using a sewing machine, consider finishing the project yourself. If not, send it out to a professional. Create a framed needlepoint piece to decorate a child's room for spring with this floral kit from Alice Peterson. The complete package costs $16.00 USD and contains a needlepoint chart and an assortment of cotton embroidery floss. The finished needlework is 5 inches wide and 7 inches high. You can stitch this African print needlepoint design no matter the season, but it is especially lovely worked in spring with cheerful bold as well as pastel colors. Make an eyeglass case for your sunglasses to match your favorite outfit, or stitch one for a graduation gift. Download the free pattern with detailed stitching and finishing instructions. Mount a piece of linen on stretcher bars or in a frame to stitch this lovely needlepoint sachet pocket. You get instructions for making two different size pockets along with color photos to show you how to finish them. Stuff the finished sachet pocket with fragrant lavender blossoms. Stamped on #14-mesh interlock needlepoint canvas, this quick abstract design is the perfect small project for stitchers on-the-go. You can finish the 5-inch-by-7-inch project in a few evenings. You don't have to keep track of your progress by checking off symbols on a chart. Just fill in the colors with the yarn in the needlepoint kit. Get this free needlepoint scissors case pattern with instructions by signing up fo the Ziva Needlepoint newsletter. You will use the simple satin needlepoint stitch to do the project. Sort through leftovers from previous projects to create an original colorful floral design.